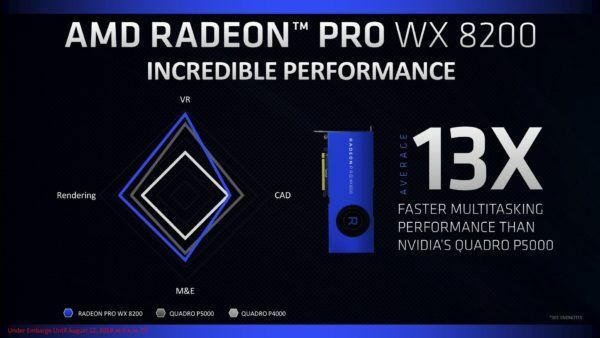 The AMD Radeon Pro WX 8200 has just been announced and AMD claims that this is the best performing graphics cards that you can buy under the $1000 mark. The AMD Radeon Pro WX 8200 is based on the AMD RX Vega 56 and come with similar specs but the clock speed is higher. For the money, you are getting 8 GB of HBM2 memory, 56 computing units and 3584 stream processors. The core memory frequency is 1500 MHz and the effective frequency is 2 GHz. 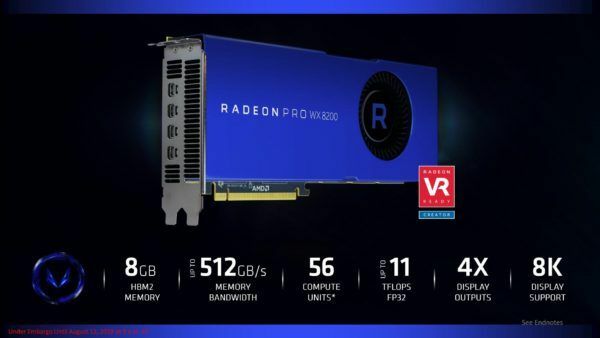 Talking about the performance of the AMD Radeon Pro WX 8200, the card is capable of delivering 10.8 TFlops of single-precision floating-point computing power and 21.6 TFlops of half-precision. The TDP has been increased to 230W and you will need 8+6 connectors in order to power the AMD Radeon Pro WX 8200. The graphics cards feature four miniDP outputs and can output to 8K. AMD aims to bring the competition to Nvidia in the workstation market and while this is a great graphics card for the price and the numbers seem to be pretty decent, we will need to see reviews and run some tests before we can confirm that AMD is actually providing the same level of performance as it is marketing. Nvidia has been dominating the market for a long time now and even though the Green team charges a premium, the performance that you are getting speaks for itself. Nvidia is on top if its game and you really can’t doubt why that is the case. The company has brought a lot of performance and value for money time after time. Nvidia graphics cards are also expected to come out soon and it will be interesting to see what Nvidia is going to bring to the table. Furthermore, the AMD Threadripper 2nd generation CPUs have also been announced. For more news regarding the AMD Radeon Pro WX 8200 stay tuned to SegmentNext. 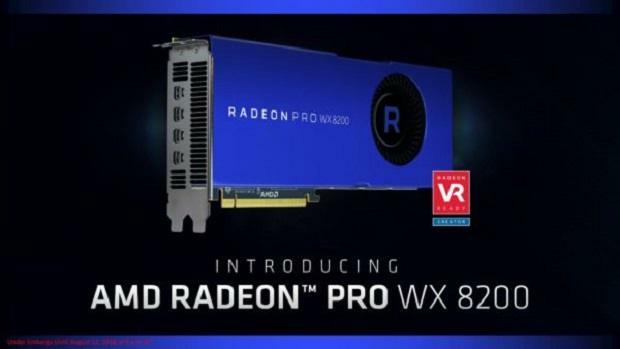 Let us know what you think about the AMD Radeon Pro WX 8200 and whether or not this is something that you are interested in getting one of these graphics cards.